The UTI test panel checks for causes of urine pain. What is in the UTI test panel? This UTI test panel includes a urine chlamydia & gonorrhea test and a urinalysis test. Why is the UTI lab test panel important? This UTI panel can help identify treatable causes of painful urination. This UTI Test Panel is a urine test. The urine pain test panel, also known as a UTI test panel, dysuria test, and painful urination test, checks the urine for causes of painful urination. Painful urination, also known as dysuria, can be occur for a number of reasons. One major reason for urine pain is a urinary tract infection, or UTI. A UTI can occur from a routine bacterial infection of the bladder or urethra or from an STD like chlamydia or gonorrhea. Pain while urinating can also occur from kidney stones, prostate irritation, rarer conditions such as porphyria, and other unidentified causes. This UTI lab test panel screens the urine for causes of painful urination by including a urinalysis test and the chlamydia and gonorrhea test. To get a UTI test panel near you, simply order online and get your urine tested at Quest Diagnostics. 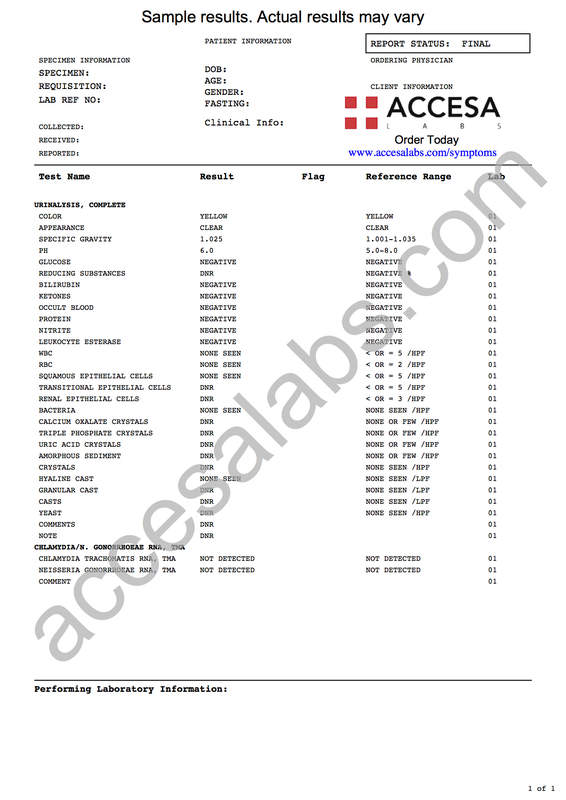 Once your UTI lab results are ready, you will be able to download and review them. As can be seen on the sample urine pain lab report, the individual components tested in the UTI painful urination panel will be reported and can be compared against the reference range provided by the lab. UTI Test Panel at Guaranteed Prices.